Likely by now you’ve heard the debate. Is fat, and in particular saturated fat, bad for you or not? In the 80’s and 90’s we made fat the villain and steered our entire country towards a low-fat mentality, but in recent years perceptions have evolved. Studies have come out to contradict previous research that found fat harmful to cardiovascular health. 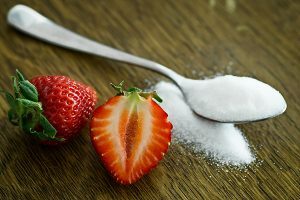 Even more recently we found that some studies were in fact manipulated to spin sugar in a more positive light and lay the health blame squarely on fat. Just a few months ago NPR reported that the sugar industry paid scientists to bias their research so that fat appeared to be the main concern in regards to heart health.1 So, what are we to believe? Studies still go both ways, but we certainly have a growing collection of research to show that fat does not deserve to be treated as an evil part of our diet. Despite years of shunning fat in favor of carbs and protein, we appear to have reaped zero health benefits. We did not see heart disease risk decrease. We did not see waistlines slim down. Increased consumption of Snackwells and low-fat lattes did not result in the statistics health experts were hoping for. Now, in fact, a recent Norwegian study suggests that fat, and again in particular saturated fat, is good for us.2 What? How could the research be so polar opposite to our previous understanding? In the study, the researchers did not simply take subjects, put them on high-fat diets, and observe the results, as many previous studies have done. 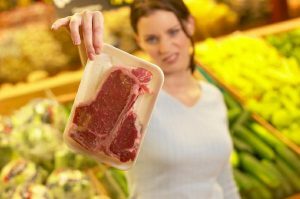 No, they put people on carefully crafted high fat diets that were rich in unprocessed or lowly processed choices, such as butter, cream and cold pressed oils. These were combined with a decent intake of vegetables and whole grains while simultaneously avoiding white flour and sugar. When compared against cohorts on a high carbohydrate diet, the high fat diet participants showed decreases in fat storage and disease risk, even when the subject’s overall energy intake increased when compared to their previous diet. This study provides a perfect example of how the entire makeup of the diet, as well as other lifestyle factors, is paramount. Singling out a particular macronutrient to vilify, while newsworthy and income-generating for some, unfortunately, has not benefited public health. Clearly, cholesterol numbers and other markers for cardiovascular disease are not independently influenced by fat intake. There are many other factors involved: sugar consumption, overall energy intake, genetics, and lifestyle factors (smoking, exercise, stress, etc). By singling out fats alone we miss the bigger picture, and in terms of public health, we put people’s lives at risk by giving them misleading information. As with most things, the answer is actually very simple. Unfortunately, simple answers do not make great billboards and campaigns. But the truth is this: an overall healthy diet is paramount, NOT exclusion of all fat. So the next time you think about avoiding that butter on your bread, think twice and reconsider the bread before you demonize the butter. Healthy fats are our friends. It’s that time of year again that I’ve come to dread: Halloween. It’s not so much that I mind the ghoulish decorations or creepy costumes. It’s mostly the colorful wrapped confections that put me on edge. All month long, for 31 exhausting days, I’m bombarded by two normally very sweet little boys whose sole mission is to find and consume candy. You just can’t avoid it. It’s in the stores, it’s at the dentist’s office, it’s at the school party …. the stuff is everywhere and every second it seems it’s all my kids can think about. Ok, I might be exaggerating slightly. They do think about other things, like TV shows and Legos, but it is amazing how much they love candy. So many tears when Mom has to say no, no, and no again. Like I said, exhausting. You might now be thinking I’m pretty much the meanest mom on earth. Who would deny their kids a few harmless pieces of Halloween candy? Look, I do give in once in awhile, but I also say no a lot. The average American kid between the ages of 4 and 8 already consumes around 21 tsp of sugar a day. That is an insane amount, as in more than 2 cans of soda worth. Halloween isn’t necessarily to blame for this, but there’s no reason to add to our already sugar laden diets. Apart from the sugar, the thing that really scares me about Halloween candy is the ingredients and additives. Yes, those pesky colors, dyes, preservatives, GMOs (genetically modified organisms) and even trans fats. They help make products tasty and eye-appealing, yes, but let’s face it, it’s not food. Let’s look at a common Halloween favorite, candy corn. Brach’s candy corn, besides sugar, also contains corn syrup, dextrose (both likely GMO corn derived) as well as yellow #6, yellow #5, and red #3. Let’s not forget that candy corn is just gross. No personal bias there. What about another all star favorite, Skittles? While these little sugar nuggets are quite tasty and addictive, they are also delivering sugar, corn syrup (GMO), hydrogenated palm kernel oil (trans fats!! ), dextrin (GMO), modified food starch, corn starch (GMO), and an assortment of food dyes, including yellow 6 lake, red 40 lake, yellow 5 lake, blue 2 lake, yellow 5, red 40, yellow 6, blue 1 lake, and blue 1. Little bodies shouldn’t have to deal with this sugar and chemical assault. I could go an on with these. You get the picture. 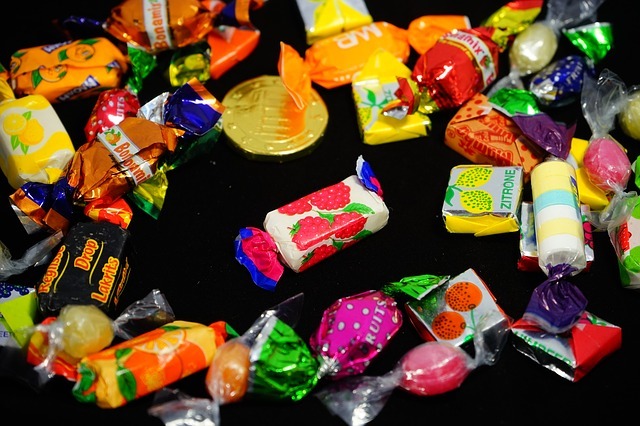 Halloween candy is far from harmless. I cringe every time I give in. I get it that kids need to be kids, but when did that become letting them eat sugary confections loaded with food additives, GMOs, and trans fats? My back up plan has been to get some tasty treats in the house that while still admittedly have sugar, at least they use natural food dyes and organic sugar cane (not saying its healthy, just less harmful). I also explain to them what is in typical candy and why it’s not good for them. I find that providing some context around my apparent meanness really helps. Then providing an alternative, albeit still carefully portion controlled, seems to keep tears at bay. I challenge you to seek out some less chemical-laden options for the little ghosts and goblins that end up on your doorstep this year. Most of these will be found in the “natural” section of your local grocer. Better yet? Give out a small toy instead or include some dried fruit and nuts along with whatever candy you choose to dispense. Maybe, just maybe, someday our country will wake up and get over this insane sugar addiction that we inflict on ourselves and our young. Maybe?